Wood tent bunk beds are really just play bunk beds. 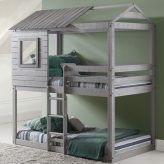 They are safe and they do offer a bed for sleeping but they are built just for kids and fun! 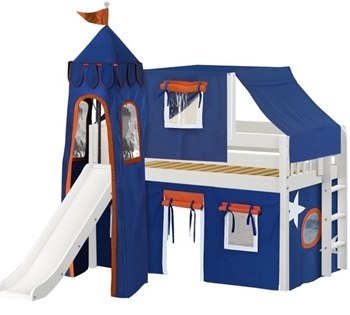 There are so many options such as slides, stairs, curtains, top tents, towers making them ideal for younger children. As your child outgrows the play aspect, you are left with a solid hardwood, sturdy bed that can be reconfigured into that study bed for your teen. So let them play while they will knowing you have a great, basic bed to work with. Change out the options and your house will become the favorite sleepover spot! Tent beds allow a child to let their imagination soar. 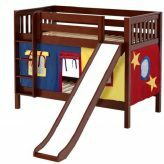 Whether it’s a princess castle bed or a castle bed for boys, we have a wide selection of colors and finishes to choose from. And when you are done with the castle phase, these beds can be taken apart and used as single beds or they can be reinvented to higher lofts for teen study beds.